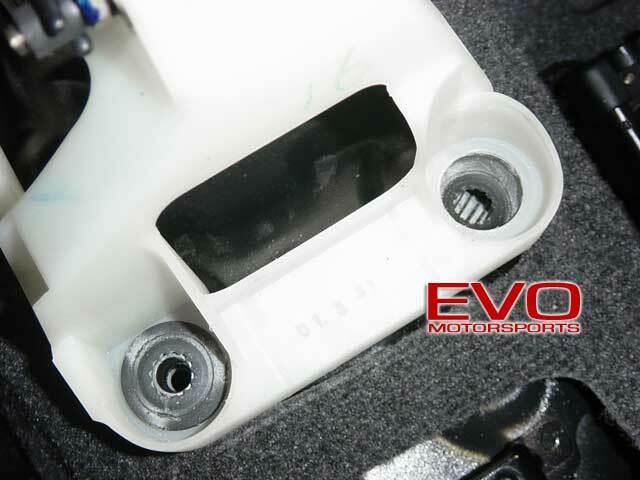 Upgrading the stock rubber shifter bracket bushings to polyurethane or metal versions will reduce "play" in the shifter bracket, which will result in more direct and more accurate shifts. This is a cheap and easy modification that will produce noticeable results. Combined with the braided stainless steel clutch line and clutch restrictor removal, you will be very impressed with the major improvement in shifting. 1. Clear all of the junk out of you center console. At the bottom of the armrest storage are two Phillips screws that need to be removed. 2. 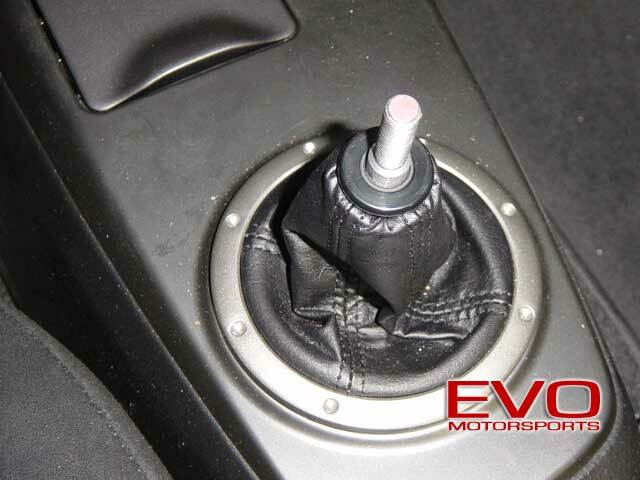 Remove the shift knob by simply turning it counter-clockwise until is comes off. 3. 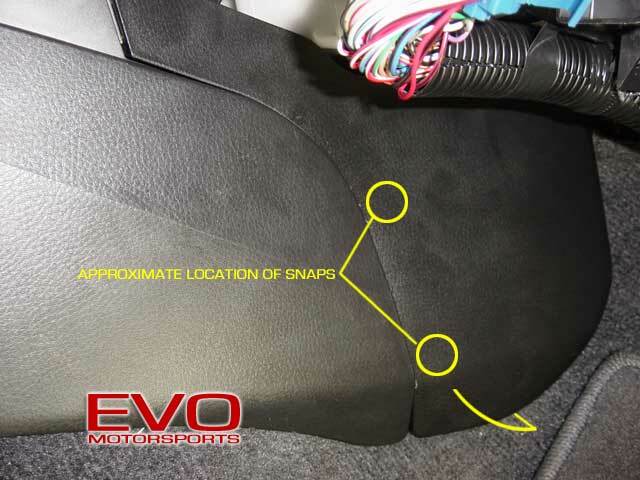 Lift the console in front enough to release the hooks (see Step 4) which hold it to the front section and then pull the rear (arm rest) up at an angle to clear the emergency brake handle. It will take a little "work" to get the center console over the emergency brake (emergency brake must be set). Be careful to not pull the cover up too high since there are electrical connections underneath that must be disconnected before it can be removed completely. Keep the front of the cover down and continue to raise the rear to get it over the e-brake and have no tension on the electrical connections. 4. 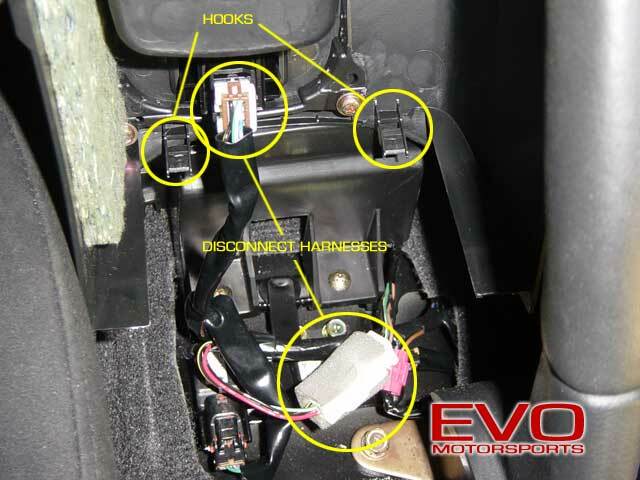 Once the cover has cleared the e-brake, with the front down and back up, you can access the electrical connections for the IC sprayer button and the cigarette lighter power. 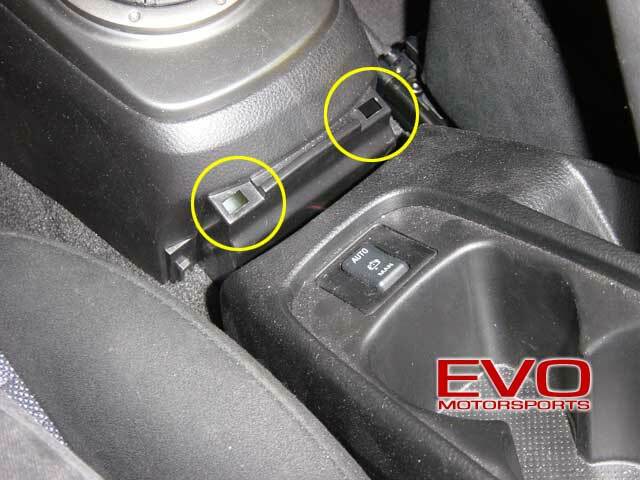 Note that the cigarette lighter connection needs to be unplugged to remove the front section, so you can do it now or later. 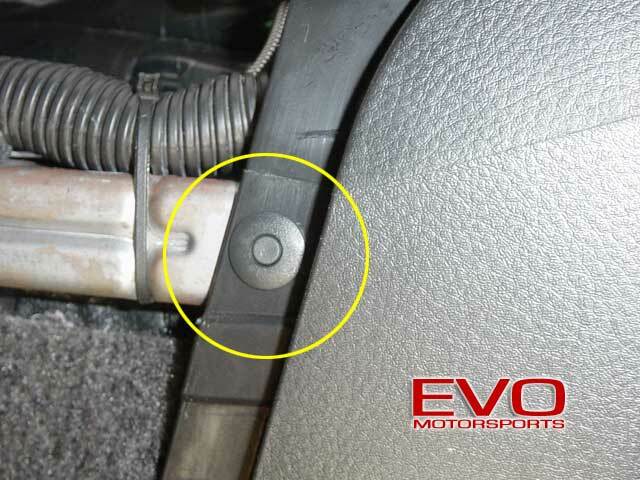 TECH NOTE: the "hooks" that hold the rear section to the front section are circled just to note what they look like. The red Scotch-Lok connector is for the turbo timer e-brake safety connection. 5. 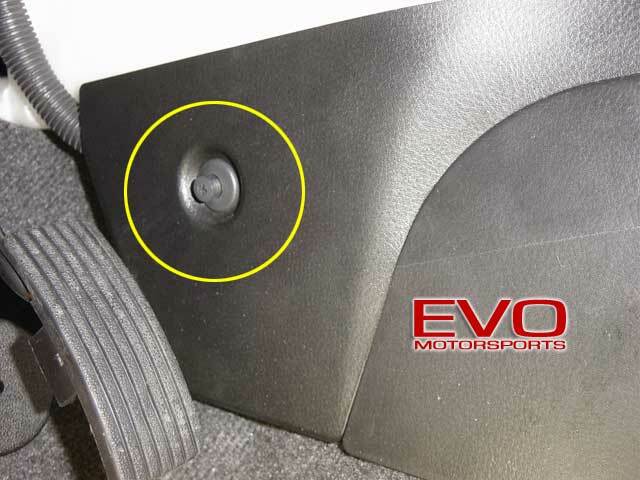 With the rear section of the console removed from the car, remove the two Phillips screws holding the back of the front console section to the car. 6. 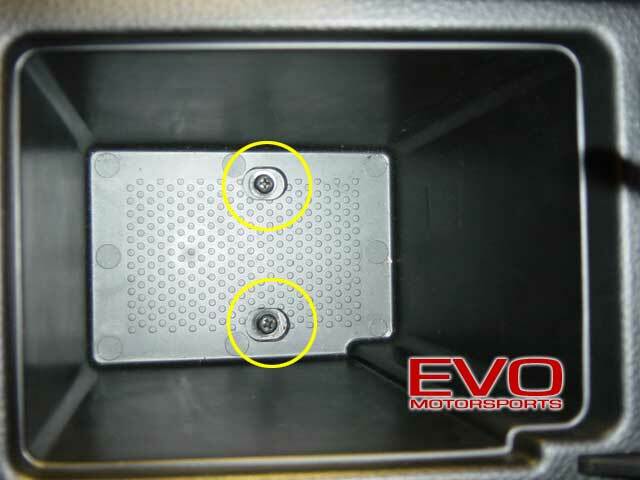 On the driver side footwell, remove the fastener holding the side cover on and remove the panel (top). 7. On the passenger side, the panel snaps off by pulling straight away from the center console. There are two snaps holding it and their approximate locations are shown (bottom). 8. Behind the side panels just removed in both footwells, there are poppet fasteners holding the center console to the car. The easiest way to remove these is by pushing the pin IN until it clicks one time, then the entire fastener can be pulled out. 9. Pull out the ashtray and then remove the single Phillips screw underneath it. With that final screw removed, carefully pull the center console out of the car, making sure no electrical connection were missed being disconnected. TECH TIP: the shifter in 2nd, 4th, or Reverse and both seats all the way back will make removing the front section of the console much easier. 10. Using pliers, remove the cotter pin holding the shifter cable to the side of the linkage. 11. 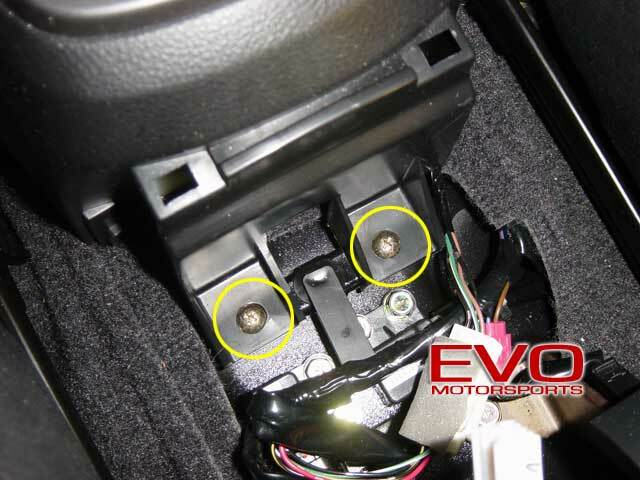 Pull the cable off and move down and under the shifter to gain clear access to the front, left bracket bolt. 12. 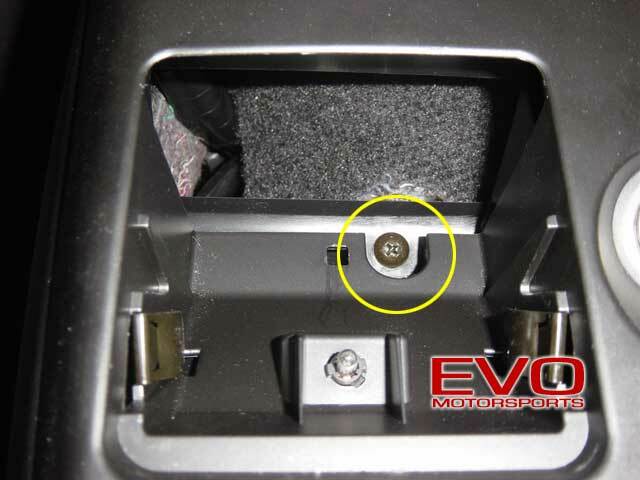 Remove the 12mm bolts holding the shifter bracket to the car. While lifting the bracket slightly, use a flathead screwdriver to push the metal sleeves in the bushings out the bottom. 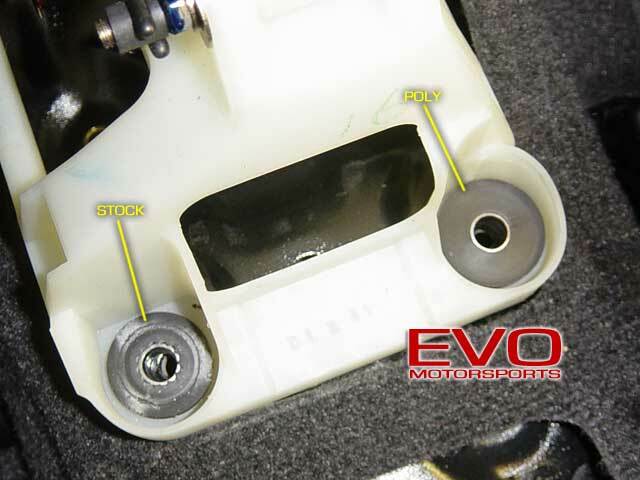 This needs to be done to make some "give" in the bushings so they can be pushed out. Push the sleeves out slowly so the screwdriver doesn't slip and cut yourself or the car. Having a hand under to catch the sleeves when they are freed will keep them from falling down into any hard-to-reach areas. 13. 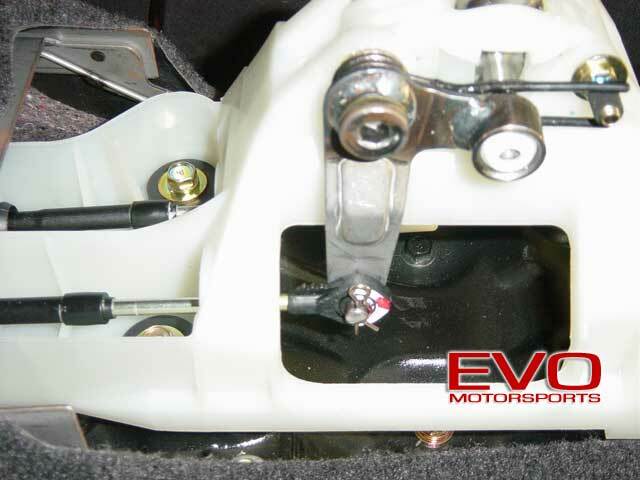 The stock shifter bushings are a one-piece design with a channel around the edge and the top and bottom "sandwiched" over shifter bracket (see Step 12). To remove the stock bushings, they will need to be "compressed" to fit through the hole. Pushing sideways and down at the same time using a flat head screwdriver or similar tool will get it done. 14. Here you can see the stock one-piece shifter bushing (left) and why it needs a little man-handling to get off of the shifter bracket. It is rubber and will give fairly easily with the metal sleeve removed, but it certainly will not just fall out. 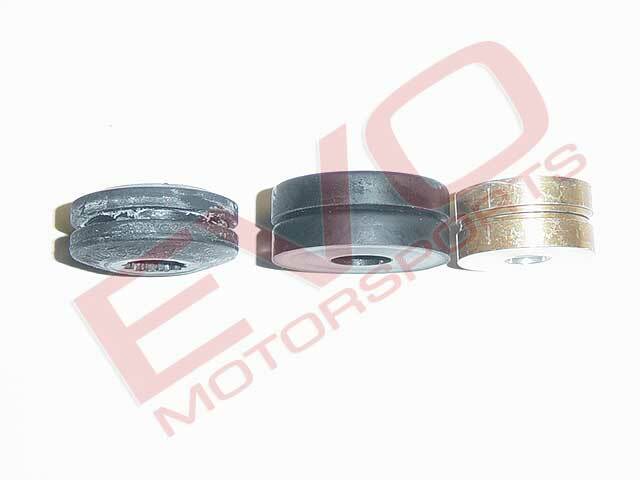 The poly and aluminum bushings (middle, right) are two-piece designs, making them much easier to install and remove if ever needed. 15. 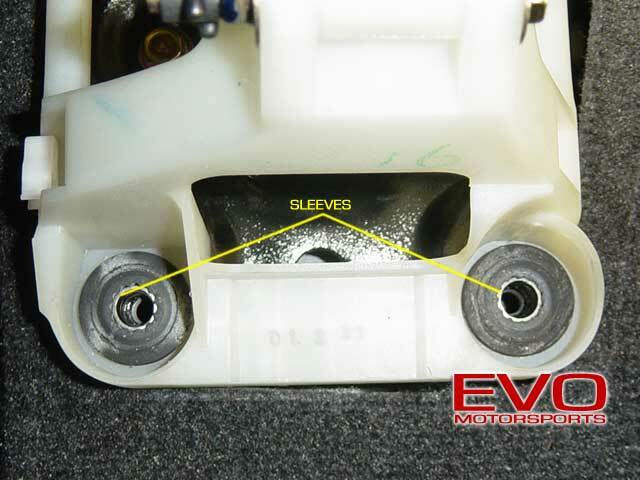 To prepare the new poly bushings for install, insert the metal sleeves from the stock bushings as shown. Note that the flat side of the sleeve will be facing DOWN when installed in the bracket. Also note that the second small section of the two-piece bushing is removed (bottom pic). 16. With the sleeves installed in the bushings correctly, push the top half of the bushings into the holes in the shifter bracket. Repeat this process for all four bushings. 17. Probably the most "tricky" part of the install is to now place the small section of the poly rings under the bottom of the shifter bracket and around the top section of bushing already through the shifter bracket. This is done pretty much by feel alone, so be patient... TECH TIP: the front bushings are the most "difficult" due to the cables, so we recommend getting the small rings on them first. 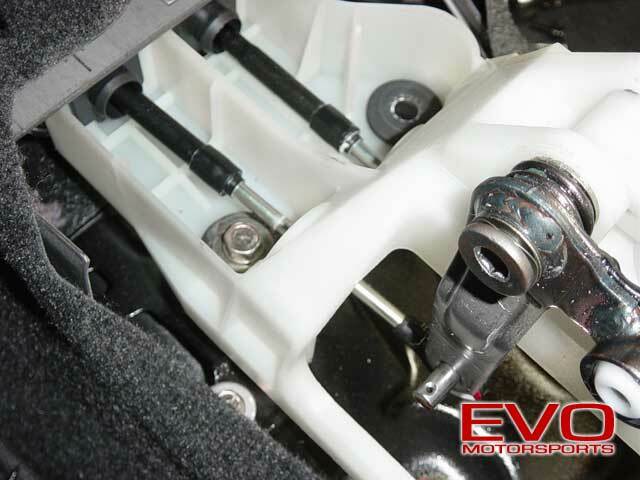 The bottom section of the bushing can be installed and the bolts hand-tightened back in to keep them in place while you work on the rear bushings. There will be enough play in the bracket with the front two bolted in hand-tight to get the lower section on the rears installed. 19. Put the console back together and take a test drive!